What’s Elon Musk’s biggest nightmare? Anticipation for Elon Musk's investor note and analyst Q&A was high last week. For the first time since the SolarCity acquisition, Tesla executives discussed 2016 results and production plans for the coming years. Here are some takeaways. EV pioneer Tesla's fate depends on the production ramp-up of its $35,000 "mainstream" Model 3. Musk said that his firm is "on track for initial production" in July, followed by "volume production by September." At some point in Q4, Tesla says it will be able to make 5,000 Model 3 cars per week, followed by 10,000 Model 3 cars per week in 2018. These are aggressive plans -- the firm has not yet started road-testing the production model. As previously reported, Tesla started making early prototypes of Model 3 cars just this month, as part of the process of testing the design and manufacturing. Guidance for 2017 was held to H1 deliveries (47,000-50,000 units), capex and auto margins, with no forecast of H2 margins, opex or solar targets. "I currently think that we should build...500,000 vehicles next year and 1 million vehicles by 2020. That's 500,000 vehicles in total, Model S, Model 3, and Model X combined next year," said Musk. Musk said Tesla has enough capital to reach the market with the Model 3, but its cash situation would be “close to the edge." To reduce the company’s risk, it “probably makes sense to raise more capital." UBS writes, "Cash burn was bad and is getting worse." According to UBS, even with a $155 per kilowatt-hour battery pack cost in 2025, "the Model 3 will still cost about $7,000 more to build than an equivalent ICE vehicle." 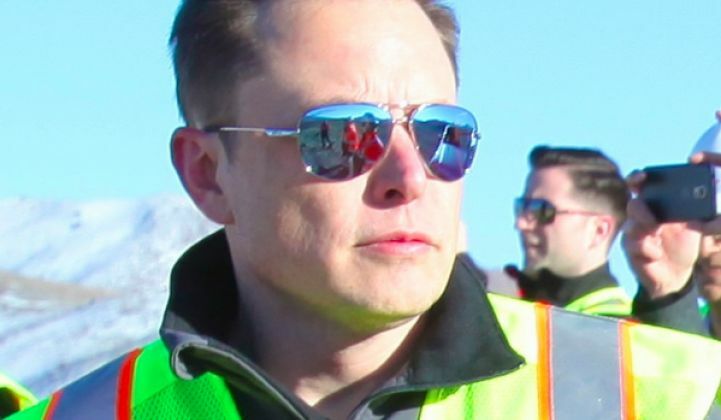 Tesla announced the resignation of CFO Jason Wheeler and the hiring of Deepak Ahuja (who served as Tesla's CFO from 2008 until 2015), for the position. Ahuja will earn a base salary of $500,000 and a $15 million equity grant. Tesla received notice from Wheeler on February 21, a day before Q4 earnings were issued. Tesla installed 201 megawatts of solar versus a guidance of 250 megawatts. The firm is now looking to "prioritize cash preservation over growth of megawatts deployed" ahead of the solar roof tile product launch later this year. Tesla aims "to reduce customer acquisition costs by cutting advertising spending, selling solar products in Tesla stores, and shifting from leasing to selling solar energy systems. "Tesla has a very strong global brand. We've got a great retail footprint. So, we've got the pieces in place to really drive customer acquisition cost down." 28 percent of solar capacity deployed during Q4 was sold rather than leased, up from 13 percent sold in Q3, and less than 4 percent in Q4 2015. Lots of great storage projects, but revenue? Battery cell production started at the Gigafactory and Tesla sold 98 megawatt-hours of storage products during the fourth quarter, the better part installed at Aliso Canyon. Other grid-scale projects include the Mira Loma substation, a 20-megawatt/80-megawatt-hour energy storage system for SCE, and a solar power and battery storage-enabled microgrid in American Samoa. If one makes a WAG of average pricing ranging from $225 per kilowatt-hour to $450 per kilowatt-hour, then large-scale energy storage revenue for the quarter at Tesla was $22 million to $44 million. "We could have released Tesla Vision and including 'high speed,' probably three months ago -- I was driving at 'high speed' personally three months ago, but I think we want to just have an exhaustive testing process, vetting process before enabling that throughout the fleet. So, we've been edging our way up there gradually. Now, longitudinal control, the Traffic-Aware Cruise Control is at 80 miles an hour. And Autosteer is at 50 miles an hour, and I think we should be able to get, unless testing shows something different, we should be able to get them both to around the maybe 85 miles an hour next month." If vehicles with autopilot and self-driving features are probably more safe than other cars on a per-mile-driven basis, shouldn't insurance premiums reflect that? In fact, Tesla is already offering its own insurance product. The CFO said, "On Asia in particular, where we started this, now the majority of Tesla cars are sold with an insurance product that is customized to Tesla. It takes into account not only this autopilot safety features, but also the maintenance cost of the car. So, it's our vision in the future that we'll be able to offer a single price for the car, maintenance, and insurance, in a really compelling offering for the consumer." Musk was discussing manufacturing: "Calculating the area under the curve is tricky when you're in an exponential. And it always starts out tiny and then spools up. Well, it spools up exponentially, but generally people have trouble wrapping their minds around an exponential, the natural tendency is to extrapolate on the straight line. And so, that's why it was important to emphasize that this is -- the spool up is an exponential. It kind of does get into a linear zone, and then it goes into a logarithm." Parking is one of Musk's "biggest nightmares"
"We're going to continue to drive efficiencies in G&A. We have to do that. In part, because we can't fit people in the building. It may seems like a silly concern, but it's really quite difficult. We have a real volumetric problem. It's a good constraint to have. So, parking is like one of my biggest nightmares. Where do we park everyone? You can't fit everyone. So we have to make our opex better because there's nowhere for people to go." Thanks to SA for the transcript.